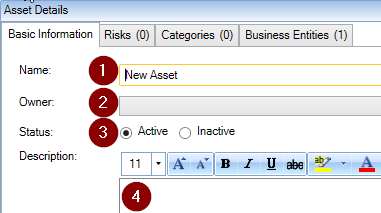 With the upgrades to the Business Entities you can now identify specific assets for a single BE or share a specific asset with multiple BEs. If you have already created an Asset in the Common – Asset section, then use the to Add an Existing asset to the selected BE. If you want to create a new Asset for this BE, then use the to Add New Asset. After you Add a New Asset, you need to input the Basic Information starting with the Name. 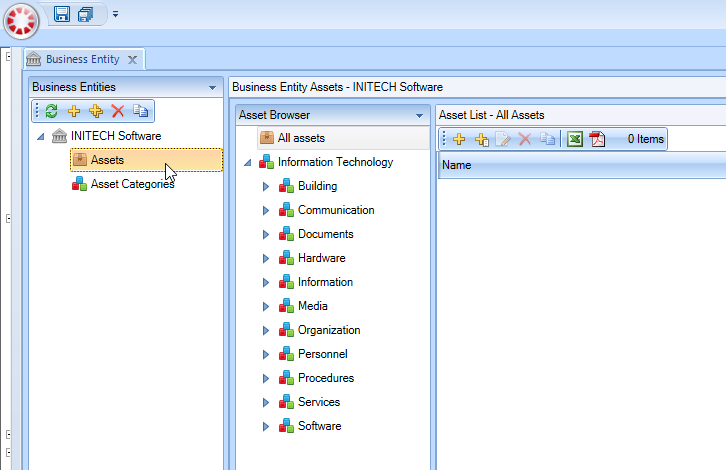 Then select the Asset Owner from the Contacts you have input into RM Studio. The Status of Active or Inactive is for just that, choosing whether an Asset is currently active, which all new assets should be otherwise there is no need to add them at this time. The reason and asset would need to be inactive is when the asset is no longer a part of the organization, a common fate for PCs and mobiles. If you have assessed the asset in a risk assessment, then the asset is locked to the database as part of the history trail. A thorough description is a vital part of proper asset registries, not only to distinguish between similar assets, but also to indicate the location of said asset.